It is strange how incidents have a profound effect on history. Back in the 1400's the Portuguese sailed around our coastline and landed at various places in the Cape. Stories that were carried back to Europe by the mariners attracted more of them to use the sea routes around the Cape to India. In the days of old the ships had no refrigeration and the crews had to survive on salted meat to keep them alive on their long journeys of discovery. By the time they arrived off the Cape coastline many sailors had the scurvy due to the lack of fresh fruit and vegetables. It was this problem that prompted ships captains to land at the Cape to find fresh water and food for their crews. Then on the 16 February 1644 the ship Mauritius Eylant arrived at the Cape. It arrived at night in thick mist and landed itself on the rocks near Mouille Point, in more or less the same area as the Seafarer went on the rocks. In those days there were no navigational lights on the shore and ships heading into the bay did so at their own risk. I don't know how they did it but the crew managed to free the ship from the rocks only to find that their hull was badly damaged. On board there was a crew of 340 people and also a valuable cargo. As the ship was in danger of sinking it was allowed to drift and was washed ashore near the mouth of the Salt River where the crew managed to transfer the bulk of the cargo to shore. As there were no facilities, no harbour, or hotels the crew had to fend for themselves on the sea shore and built a small fort out of vats rescued from the ship. For protection they erected a cannon that came off the ship as well. As luck would have it another Dutch ship “The Vrede” was in Table Bay at the time. It loaded a substantial amount of the cargo and the Captain and forty of the crew of the Mauritius Eylant and sailed for Batavia. The balance of the crew were left in Cape Town to fend for themselves. When the news of the wrecking of the Mauritius Eylant got back to Batavia a ship the ” De Tijger” was sent to rescue the crew and pick up the balance of the cargo that had been left in Table Bay. The 300 men who had spent four months on the beach in Cape Town reported back to the Batavian authorities that they had experienced limited discomfort and that no one had died during their enforced stay at the Cape. The Dutch East India Company then realised that it was possible to establish a half way station at the Cape. Plans were put together and in 1652 Jan van Riebeeck arrived on his three ships to start the supply station. If he could see what Cape Town looks like today he would be absolutely amazed. 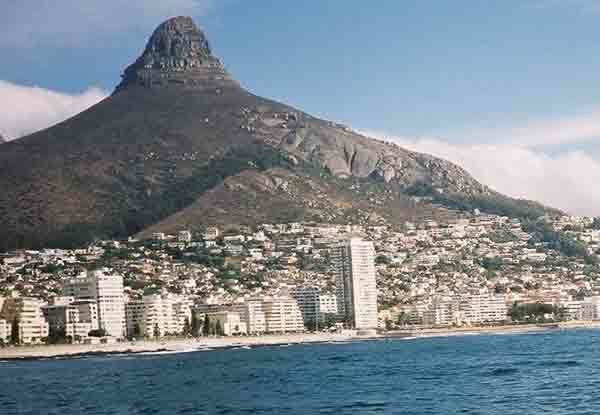 From where he built his fort near the base of Table Mountain to Melbosstrand and beyond, the whole coastline has been built up. Cape Town has become a thriving metropolis and welcomes visitors with open arms.